Oh, Disney, what happened to you? Did you never learn from the past or grew up? I know that after many decades you have your style you want to retain no matter what. I know you have your image of a company producing fairy tales and other kid-friendly stuff, and I know you want to stick to that. But, well, you seem so out of touch than never before. 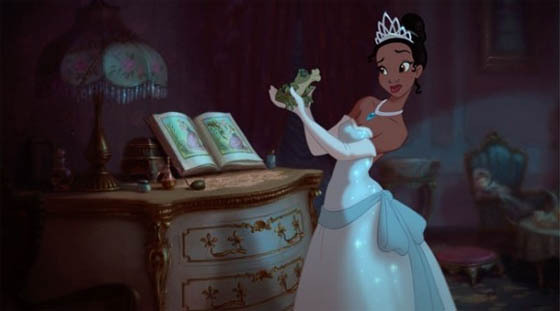 After looking at the character designs, story outline and the teaser trailer to your newest 2D animated movie THE PRINCESS AND THE FROG I can’t stop wondering if we’re really in the 21st century or still living in the early 1990s or even the 1960s. It seems that you really didn’t evolve one bit. Even worse, it seems that you constantly rip yourself off, so to speak. True, judging by your teaser, your storytelling might have gotten a bit more ironic, funny and modern, but would it have been that hard to go the full way? You know, like ditching this whole princess and frog stuff, telling a modern tale that seems relevant to us today. Ditching the fancy castle/house and the Barbie-puppet clothing would have been a very good first step. Creating a main character that doesn’t look like a cross between Tinkerbell and Ariel would have been a wonderful second. Ditching the talking animals, a story device so old and recycled to death that even 3D animated use it, would have been a marvelous third step. Ditching the insane formula of “animation = musical” would have been the mesmerizing last step. And what about reflecting our modern world on the visual level? Would it have been that hard to use a visual style that fits to this modern world? You know, like roughing it up a little, or by using a different color style? Look at some of the examples in my post about benefits of 2D animation and you know what I mean. Did you never consider going experimental? Doing something nobody ever would expect? This doesn’t mean you have to stop producing your regular stuff like this new movie. I can fully understand you have a family-friendly image you want to keep. But don’t expect me to wait for such movies when you release them. I am grown up and living in the 21st century. Just leave me a message when you’ve caught up.